Cleaners find a hard time cleaning up after a repair or renovation projects. Sweeping the debris and other dirt on the floor can be exhausting. However, you do not need to spend a whole day cleaning the workspace after working on a project for a whole day. You can simply the cleanup work using the Makita DUB182Z 18V Cordless Blower. Besides cleaning job sites, this great on the go blower that assists you to clean a workshop, home, shops, and other places need regular cleaning. Is this model worth considering? Let have a closer look at this cordless blower. Makita DUB182Z cordless blower is a versatile tool perfect for both professionals and general users. It is built for maintenance professionals, remodelers, repair people, cabinet installers, electricians, woodworkers, as well as any other general contractor looking for a cordless blower. You can use it for regular cleaning as well as clearing wood pieces, sand, or plastics after a renovation project. The Makita DUB182Z 18V Cordless Blower is a perfect choice for individuals looking for on the go clean up tool for workshop and job site. This tool pairs the handiness of a cordless tool with superior power in a lightweight product that is easy to use on all sites. Improved operator comfort facilitated by rubberized and ergonomic grips. Unless you live under a rock, you must have heard of the benefits that come with a brushless motor. This motor increases the tools power efficiency, allowing you to work for longer before draining the battery. In addition, this three-speed motor has the capacity of producing air velocity of up to 179MPH. Speed variable motor allows you to tackle dirt efficiently while still maximizing the battery potential. In nonprofessional’s language, setting the speed at minimum will allows you tackle small and light debris with ease. On the other hand, you can adjust the speed to maximum to clean a lot of large debris with ease. 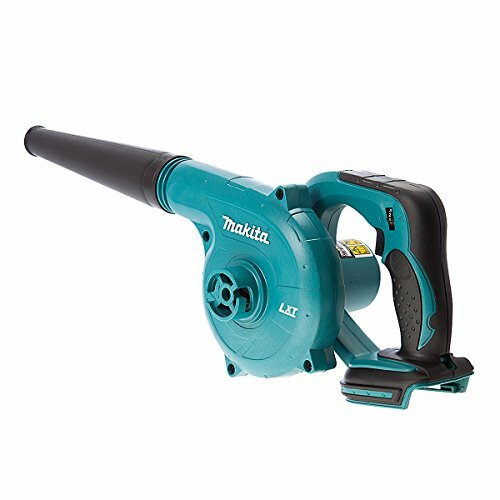 The Makita DUB182Z Cordless Blower weighs just 3.9 pounds together with the battery. Besides, this product comes with a compact design measuring only 20.75inch long. This makes it not only easy to maneuver but also use it in tight spaces. You will also love the ergonomic handles with a soft grip for reduced user fatigue. Another impressive feature that you will love about this tool is the unique star protection controls from Makita. This star protection computer control is a technology that enables the tool and batter to swap data to monitor its condition. This protects the device from overcharging, overheating and overloading. This ensures that you can get a reliable performance for a long time. Regardless the price of the tool, you would expect it to get a product that offers you with the service you wanted. Unfortunately, not all products give you the performance it promises. However, Makita believes in offering quality products and prioritizes customer satisfaction. This tool is backed with 30 days money back in case the blower doesn’t give you the service you need. Additionally, you are given a three years warranty on tool and one-year warranty on the battery. A high-quality blower should give you a runtime of not less than 10 minutes. Anything less than this will mean that you will have to recharge before completing the cleanup. The Makita DUB182Z bower gives you a runtime of 12 minutes, which is more than enough time for completing most cleanups. Powerful battery providing you with a longer runtime. Makita DUB182Z 18V LXT Cordless Blower seamlessly combines the convenience of a high-quality battery, compact design, and cordless convenience; to bring a tool that you will love using. With an endless list of application, this tool can be used by repair people and any other contractor looking for powerful cordless blower.